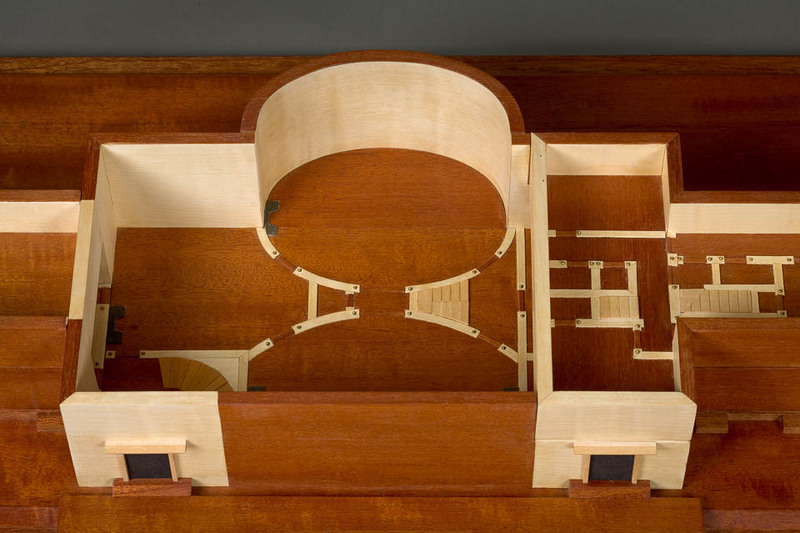 This first commission from Gore Place in Waltham, MA, was to create a model of the mansion that would help make it more understandable to sight-impaired visitors. 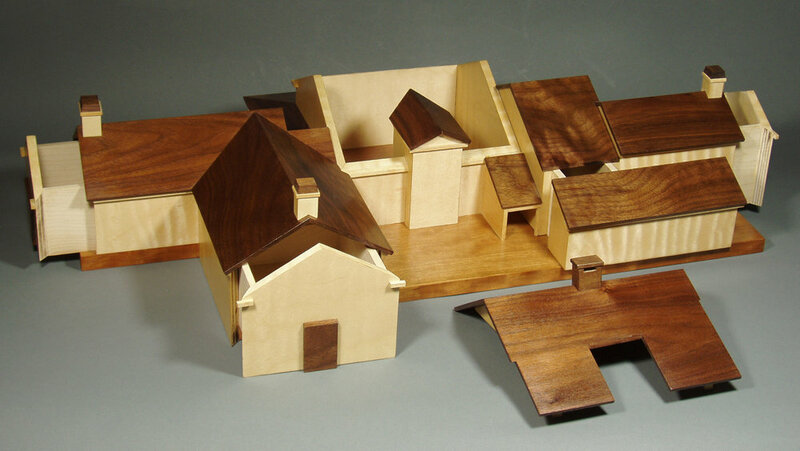 While the main goal was informational, the secondary goal for me was to make a model that was beautiful and looked as if it could have been made at the same time that the house was built. The problem to solve with this box, besides how to open it, was deciding what was the right level of detail. As with all my commission work, the aim was not to create an exact replica but a close enough abstraction that highlighted the most important details. I decided to leave out the window placement and focus on the interconnections of the various floor levels and the floor plans themselves. To get inside the box, its outer shell lifts off in three pieces - the central section and the two wings. Inside, the stories are trays stacked on eachother, a feature which helps demonstrate the odd configuration of the mezzanine floor in the two wings. 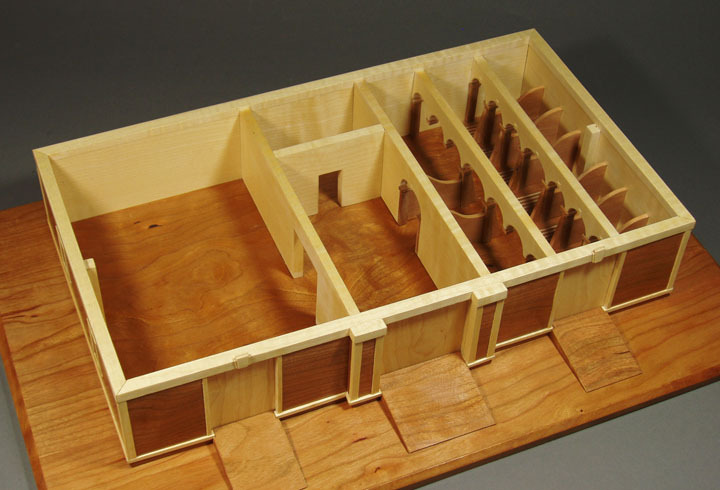 On the floor of each tray is a floor plan of raised veneer. Stairs are indicated by raised louvered veneer, doors by raised brass brads, and fireplaces by raised shapes of sandpaper. A separate plaque gives the key in Braille for these features. The woods are figured mahogany and English maple. 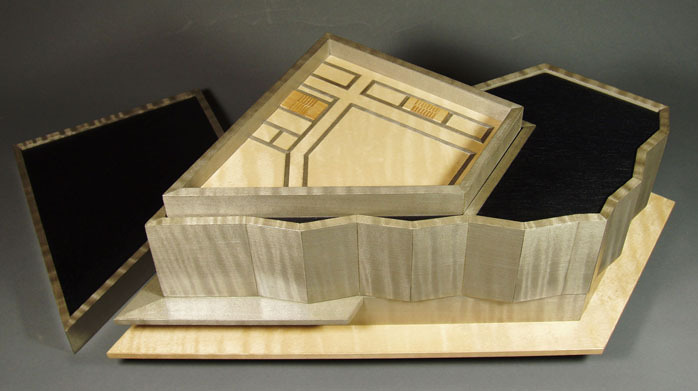 The dimensions on the stand are 10"h - 42"w - 25"d.
This box was commissioned as a present to the president of Berklee College of Music, who was responsible for the creation of this new building. 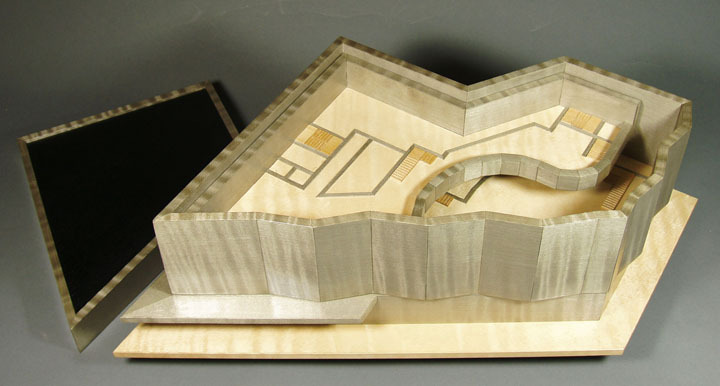 The idea was to build an aesthetically pleasing abstraction of the building rather than an exact model. As the building facades are entirely glass, I chose a highly figured grey-dyed English sycamore as the main wood. 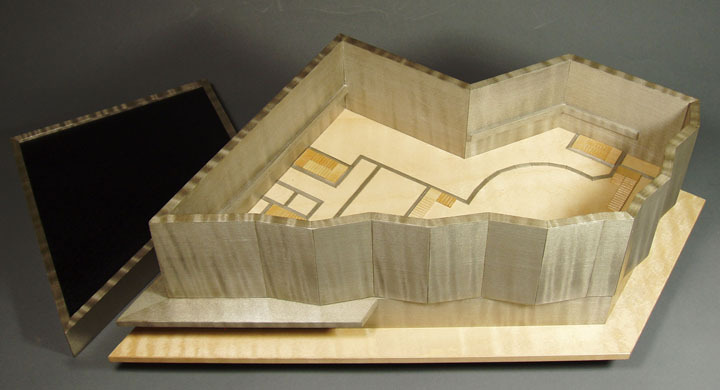 It was decided to leave out the multi-story tower that rises above the larger base of the building and to focus on the six lower floors which are the core of student activity. Very important was to show the floor plans of these six floors, which I did using strips of veneer to indicate walls and stairways. Each floor is a layer of the box and lifts off to reveal the layer beneath. The four above ground layers are deep enough to be containers. For aesthetic reasons I made the two basement levels shallower and combined them into the base of the box. This box was commissioned by Gore Place to try to make its newly restored carriage house more understandable for sight-impaired visitors. Both interior and exterior details were important, and some labeling in Braille was required. 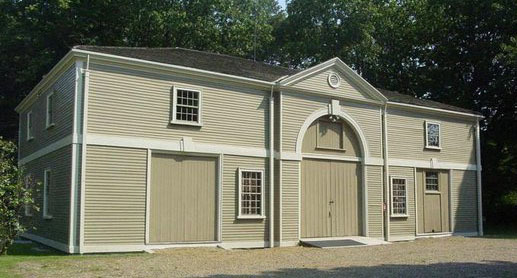 When you lift off the roof of the box, you find a removable plaque with a raised floor plan of the building with the rooms labeled in Braille: carriage room, tack room, harness room, and stalls.The plaque sits on the floor of the loft of the carriage house, and to the right are the openings through which hay was dropped into the stalls below. When the plaques is removed the loft floor can be lifted out to reveal the main floor below. When the loft floor is removed, the main floor rooms are revealed with highly detailed stalls with arched entries and curved stall walls, and stall floors with channels that once directed urine and dung to a trough with a hinged cover. The cover was lifted and the waste swept down to the basement below. This box also has a cover that can be opened. The dimensions are large enough that a hand can comfortably explore the various details of the interior. 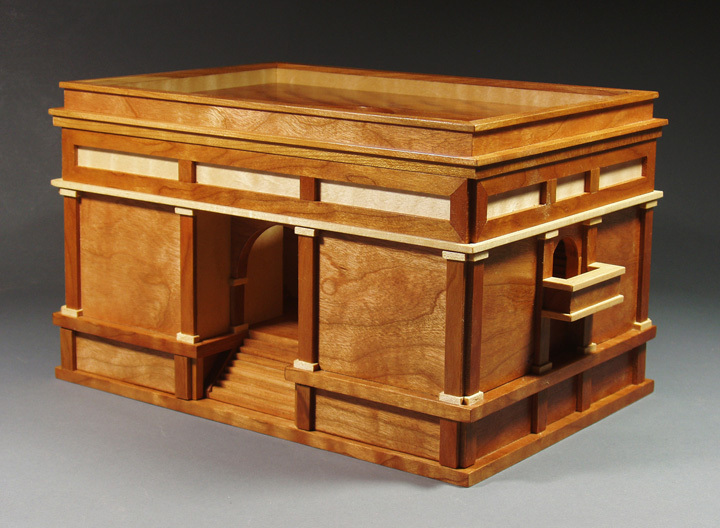 The woods are cherry and maple, and the box on its base measures 8" h - 22"w - 14"d.
This puzzle box was commissioned as a gift for the owners of the house and is based closely on the architect's drawings. 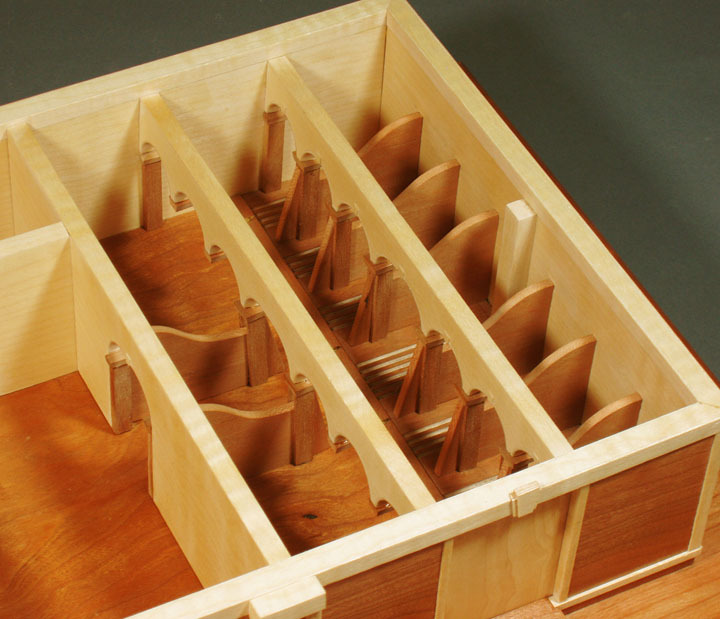 A specific order must be followed to access the five compartments: roofs lift off, locks must be removed, house sections separate ,and drawers pull out. 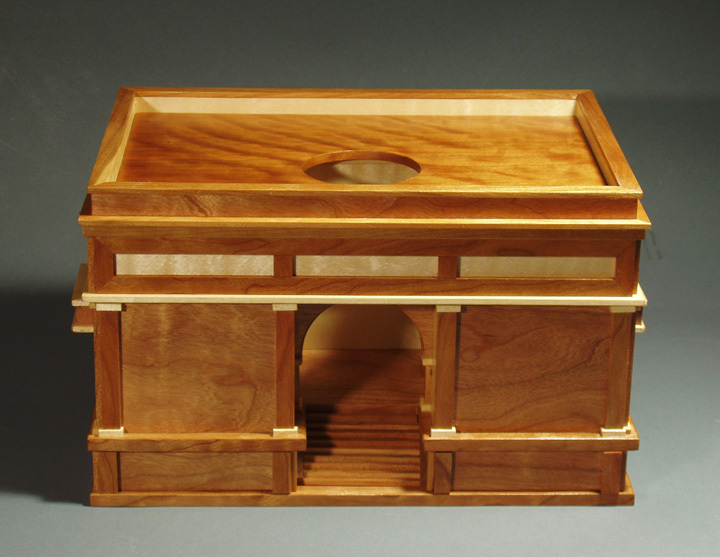 The woods are walnut and curly maple and the overall dimensions are 6"h - 20"w - 12 "d.
This small architectural fantasy is a jewelry box commissioned for a friend’s wife. The recessed lid is lifted out by means of the open skylight, revealing a tray compartment. When this is lifted out three more compartments are revealed. The oblong compartment is also a tray that can be lifted out. At the base a shallow drawer pulls out. The woods are figured cherry and maple, and the box measures 7” high by 11 1/2” long by 9” wide.